Please note; this is an extended version of my story published earlier today on the Orange County Register Web site. Though Andrew "Dawson" Heringer and Marlana "Marie" Sheetz both attended UC Irvine, the musical pair known as Dawson & Marie rarely performs in Orange County. That will change Friday night (April 30) when the eclectic folk duo performs in Dana Point as part of the Lord of the Strings concert series. "We are based out of Sacramento at this point," said Heringer, a theater major who earned his bachelor's degree at UCI in 2007. He responded to a series of questions I posed via email earlier this month. "We both grew up in a small town in the Sierra Nevada foothills ... called Placerville (home of the 1849 Gold Rush), although Marie and I didn't meet there. We met through mutual friends at UC Irvine." Dawson & Marie are on tour in support of their superb debut album, "Months Vol. 1," a collection of seven original songs, six of which feature months in the title. "When we started writing together, we wanted to create something that stood out from each of our solo projects," Heringer said. "We knew we wanted a concept but couldn't decide on anything. One day I sent her a text message after playing music at a cold and windy wedding on Pismo Beach saying, 'It feels like December at the beach,' to which she responded, 'Wait, I've got it; our CD should be songs about the months of the year.'" "With some songs (on the album), we wanted to capture the mood of the month for the song. 'August' is a great example of this. I think 'May, It's Raining' also does a great job of capturing the vibe of an unusually wet late-spring day. Other songs (notably 'July') were more about a particular story that came up for us." 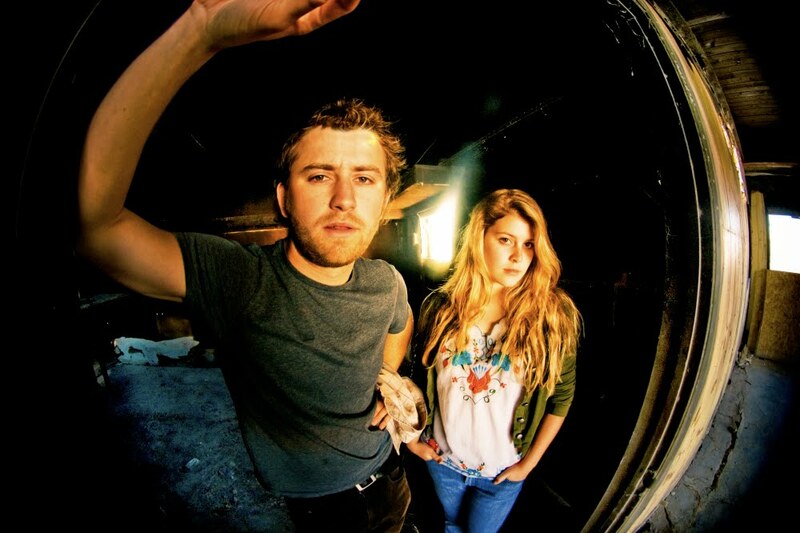 In addition to their original material, Dawson & Marie also play a few reworkings of material from the likes of Kings of Leon ("Use Somebody") and Iron & Wine ("Naked As We Came") popularized via YouTube. But when the duo performs in Dana Point on Friday, it’s likely that it will be the duo’s original songs from “Months Vol. 1” that will be the most compelling songs of the night. Where:Dana Point Community House, 24642 San Juan Ave. This landed in my inbox earlier today. I count my experiece of seeing Cheap Trick perform "Sgt. Pepper Live" at the Hollywood Bowl as one of my top concert experiences. Ever. LAS VEGAS, April 27, 2010 -- "Sgt. Pepper Live" featuring Cheap Trick, a dazzling musical experience featuring world-famous rock stars, the Sgt. Pepper Symphony Orchestra and a live interpretation of one of the most beloved rock albums in history, will take the stage for a limited engagement beginning June 11, 2010 at the Paris Las Vegas Theatre. A Bill Edwards Presents Inc. production, tickets for "Sgt. Pepper Live" featuring Cheap Trick are now on sale. Tickets are priced at $75, $100, $125 and $250 and a VIP package priced at $275. All ticket prices are plus applicable tax and fees and may be purchased at the Paris Las Vegas box office or on-line at http://www.parislasvegas.com/ or http://www.ticketmaster.com/ or by calling 1.888.727.4758. Show dates on sale include June 11-12, June 15-16, June 18-19, June 22-23, June 25-26, June 29-30, July 20-21, July 23-24, July 27-28 and July 30-31. Showtime is 8 p.m.
A celebration of The Beatles' influential album, “Sgt. Pepper's Lonely Hearts Club Band,” the show is an energetic performance that features an orchestra and a captivating experience of light and sound as Cheap Trick perform the entire album live as well as select Cheap Trick songs that lend themselves to orchestral arrangements. Geoff Emerick, the renowned engineer of The Beatles' classic 1967 album, supervises the audio production. Never performed in its entirety by The Beatles due to the complex studio technology of the day that was employed in the making of the album, "Sgt. 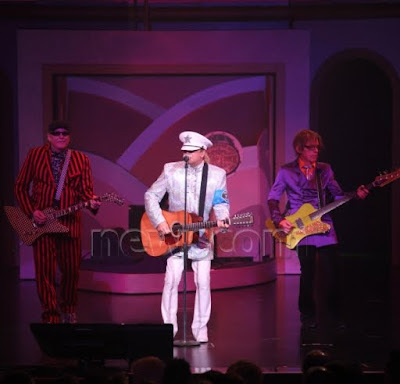 Pepper Live" allows Cheap Trick to incorporate their brand of power-pop into the classic songs while paying tribute to music legends in an unforgettable musical experience. "Paris Las Vegas, at the heart of the Las Vegas Strip, is the perfect venue for this world-class musical experience," said Bill Edwards, CEO of Bill Edwards Presents Inc., and executive producer of the production. "Bringing the music of The Beatles together with the performance of Cheap Trick creates an unforgettable show that brings to life one of the most beloved albums in rock and roll history in a truly innovative way." Cheap Trick is best known for its classic singles, "I Want You To Want Me" and "Surrender." The American power-pop progenitors recorded the album All Shook Up in 1980 with Sir George Martin and Geoff Emerick, producer and engineer of Sgt. Pepper's Lonely Hearts Club Band. Emerick will continue to oversee the audio production for "Sgt. Pepper Live." He received Grammy Awards for the engineering of Sgt. Pepper's Lonely Hearts Club Band and Abbey Road. From its dramatic 50-story replica of the Eiffel Tower to authentic architectural reproductions, Paris Las Vegas features elegant decor, European-inspired boutiques and a distinctive array of fine cuisine, including Chef Joho's acclaimed Eiffel Tower Restaurant, Les Artistes Steakhouse and French-bistro Mon Ami Gabi. The resort celebrates the romance and excitement of the European City of Light. In the heart of the famous Las Vegas Strip, the passion and sophistication of Paris Las Vegas transports guests to Europe's most romantic city. Paris Las Vegas is a Harrah's Entertainment Resort. About Bill Edwards Presents Inc.
A premier live entertainment company, Bill Edwards Presents Inc. has been producing world-class concert attractions for more than a decade. With a mission to maximize the live concert experience, Bill Edwards Presents Inc., is committed to booking, producing and marketing live concerts for artists around the globe. Based in St. Petersburg, FL, the company has produced events in marquee venues around the United States and the world with artists such as Cheap Trick, Alicia Keys, John Mayer, Josh Groban, Kool & The Gang and countless others. On The Rural Route 7609 is a four CD set that chronicles, in a most unique way, the arc of John Mellencamp’s career, with a focus on his songwriting. Universal Music Enterprises has set June 15, 2010 as the release date for the collection through its Mercury imprint. The package, unlike typical box sets that tend to slavishly offer a chronological presentation of hits and near-hits, is programmed as if each of the discs were a freestanding album. The 54 tracks included in the collection are presented, in essence, as four albums with songs juxtaposed in a manner that offers the listener the experience of hearing them in a context that sheds new light on the themes and artistry that have made Mellencamp’s music so cherished by so many over the course of four decades. While On The Rural Route 7609 offers a wealth of well-known material, a significant number of the tracks included are less familiar but equally compelling, especially in terms of providing an in-depth picture of Mellencamp's spectrum of creativity. The concept behind the four “albums” of the collection is to give long-term Mellencamp fans and newer listeners alike, a more complete and insightful view of the artist's role as a writer and artist whose catalog of songs and recordings resound with substance and nuance. The songs selected reflect the artist’s pop idol origins through his ascent to the ranks of America’s most respected and socially active writers and performers. On The Rural Route 7609 offers 17 tracks previously unreleased on any John Mellencamp CD including guest readings of Mellencamp’s lyrics by Academy Award® winning actress Joanne Woodward and best selling author/educator Dr. Cornel West. The discs are packaged within a 72-page book that includes an exhaustive essay and comprehensive track-by-track annotation by award-winning writer Anthony DeCurtis. His marathon interviews with Mellencamp were conducted in Bloomington, IN where DeCurtis, coincidentally, earned his PhD in American literature at Indiana University. Mellencamp tells the story behind each of the songs included in the set and there's a scholarly introductory essay by DeCurtis as well. The package, a truly lavish assemblage, includes rare and evocative photos printed on heavy stock that make On The Rural Route 7609 a distinctive set of albums, in the sense that albums -- as originally conceived in earlier times -- are cohesive collections of music. 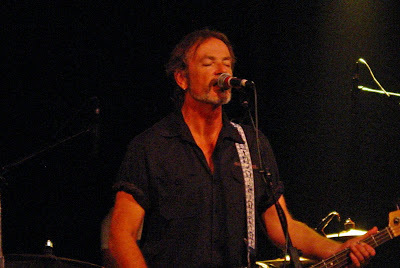 While such Mellencamp hits including “Rain On The Scarecrow,” “Jack and Diane,” “Jackie Brown,” “Pink Houses,” “Your Life Is Now,” “Our Country” are presented, less familiar songs as well as demos for “Cherry Bomb,” “Authority Song” and other recordings serve to chronicle the maturation of Mellencamp as both an artist and songwriter over the years. As quoted by DeCurtis in the 4500 word introductory essay included in the package, he explains, “We tried to make it like a process of discovery, that perhaps somebody could listen to this set and discover these songs.” Material from early works through his most recently released album, Life Death Love and Freedom which Time Magazine called his "best in a decade" and Rolling Stone ranked #5 in its listing of 50 best albums of the year, gives the listener an opportunity to consider more than 30 years of Mellencamp's output in a musically coherent manner. The title of the package is reflective of Mellencamp’s continuing role as a troubadour who conveys the hopes, heartbreak and realities of the heartland – that part of the country that politicians are wont to call “the real America,” a divisive jab that is at odds with Mellencamp’s true themes. Per DeCurtis, “..the set takes its title from a scarifying murder ballad on Freedom’s Road, ‘Rural Route.’"
Adds DeCurtis, “It does. 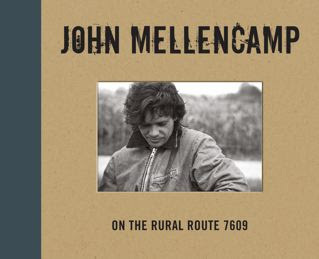 But, more important, for anyone interested in finding the real John Mellencamp, this is where he’s been, and where he lives.” On The Rural Route 7609 is a musical journey that sheds new light on an American musician who, as both a songwriter and social activist, has never rested on his laurels or past accomplishments. Photo information: I was in the VIP area on Sunday, April 18 when I ran into singer-songwriter Jónsi. Although it was just a week ago when I was beginning my Coachella Valley Music & Arts Festival experience for 2010, it really does seem like a lifetime ago. Although I posted several video blogs from the Empire Polo Club and the Orange County Register published a series of four posts on my experience at the three-day event earlier this week on the Soundcheck blog, I wanted to offer up a final rundown of my trek to Coachella here. Coachella for me got started with a roar. Indeed, New York's As Tall As Lions was the first artist I caught and ultimately proved to be the biggest surprise of day one. Performing in the Mojave tent, the Long Island quartet focused on songs from 2009’s excellent You Can’t Take It with You, including its excellent title tune and the lead-off track “Circles.” The band clearly is ready to make that leap to the Big Leagues, with singer-guitarist Dan Nigro leading his mates through an undeniably powerful 45-minute set. It can be exceedingly difficult for a young band to make an impression in the early and hottest part of the day, amid an overwhelming and conflicting schedule of Huge Names. But As Tall as Lions stood out all the same. Hockey is an energetic quintet whose sound recalls '80s dance rock. The Portland, Oregon band's strong 40-minute set (played out in a very hot part of the day) included "Work," "Wanna Be Black" and several other standout tracks from 2009's "Mind Chaos" album. Although I can't recall any day at Coachella in my previous years of attending the fest that I didn't catch at least one set on the main stage, this day was different. After Hockey finished up around 5:10, I headed over to the Outdoor Theatre and ended up spending the rest of Friday afternoon and night there. She & Him delivered a breezy, fun and memorable set of retro-'60s tunes from the duo's releases. As good as the two albums from singer-songwriter Zooey Deschanel and multi-instrumentalist M. Ward are, I wondered how the music would go over in a spacious outdoor setting. No worries; songs such as "Over It Over Again" (from "Volume Two") and "This Is Not a Test" (off "Volume One") sounded great. The duo's 45-minute set was among the most fun I saw all weekend. Passion Pit also had success here. The Boston-band ensemble definitely impressed in its Coachella debut. Lead singer-songwriter Michael Angelakos noted playing at the festival was a “Dream come true” and noted the Massachusetts band had never played a show with this many people. Passion Pit featured songs from the band’s impressive 2009 debut “Manners,” including a riveting “To Kingdom Come.” The group’s mix of ‘80s synthesizer, techno and other dance-pop styles was a great fit as the sun dropped down over the mountains and cooling temperatures were taylor made to get the huge crowd to move to the music. After the high-powered set delivered by Passion Pit on the Outdoor Theatre stage on Friday night, it appeared that someone took a gigantic broom and swept everybody away. Indeed, at 8 p.m., it seemed that Echo and the Bunnymen might well be performing in front of a sparse crowd despite the ideal time frame. However, Ian McCulloch (pictured above) and his band mates had no cause for concern. By the time the ‘80s hit makers took the stage just after 8:30 p.m., a large crowd was on hand to hear the outfit play many of its greatest songs in the magical setting at Coachella that seems to make even classic rockers sound like they have plenty to prove. The biggest cheers came for Echo & the Bunnymen’s fantastic “The Killing Moon” and “The Cutter,” however the band scored early and hard with “Do It Clean” (an older song that was a hit for the band in England) and “Nothing Lasts Forever” (a medley that included bits of Lou Reed’s “Walk on the Wild Side” also came in that song). McCulloch sounded strong and his voice hit all the notes like it was 1985 again. Although many artists come to Coachella to define and validate their status as an up-and-comer, Echo & the Bunnymen’s 50-minute set offered up a chance to see this band – as well as its songs – still matter. Vampire Weekend drew the lively response from the audience that Passion Pit had several hours earlier. I have to admit to having not yet fallen under the spell of the band, but there is no doubt that just about everyone else crowded in front of the Outdoor Theatre couldn't get enough of the troupe. Day one ended with a strong set from Public Image Limited. My favorite performances proved to be of the songs I knew from radio airplay ("This is not a Love Song," "Rise"). John Lydon is an interesting and outspoken frontman and made good use of his late-night platform to rant, rave and rock. Although I had caught a mind-bending seven full-length sets from seven artists on day one, I was in for an even longer day of music listening on day two. But pity those who didn’t get to Coachella early on day two. Two of the best performances I caught on Saturday amounted to a one-two punch on the Outdoor Theatre stage, thanks to Seal Beach-based Rx Bandits’ 55-minute set and Porcupine Tree’s near hour-long foray on the same stage that was to follow. Rx Bandits made the most of their early showtime (12:30 p.m. is early, especially with the sweltering early afternoon sun), performing in front of a relatively small but rabid fan base that was here to see “their” band. When the band originally formed in Orange County in the late 1990s, Rx Bands (then billed as the Pharmaceutical Bandits, the group was part of the popular ska movement (think No Doubt, Jeffries Fan Club, etc.). No more. The band now plays a masterful blend of folk, blues, jam rock and doses of just about everything else. Master chops and strong song selection were key to RX Bandits’ solid outing at Coachella, including several tracks where singer-guitarist Matt Embree and lead guitarist Steve Choi would dual on electric guitars. Bassist Joseph Troy and drummer Christopher Tsagakis were part of the well-armed outfit. Porcupine Tree proved to best several more high-profile hard rock bands that I also saw perform on Saturday, including buzz trio Band of Skulls and main stage rockers Coheed and Cambria. Indeed, I thought the relatively-unnoticed English group performed one of the most impressive sets of day two, with several concert-goers coming up to me and asking “Who are these guys?”-styled queries. The nuance of the British folk-meets-progressive rock of Porcupine Tree was a revelation, notably the beautiful and reflective “Lazarus” featuring lead singer Steven Wilson seated at the keyboard and singing one of the key songs from “Deadwing.” Later in the set, he set out with his bandmates on the ambitious “Time Flies.” One of the featured tracks on 2009’s “The Incident,” “Time Flies” featured him playing both acoustic and electric guitar and showcased the natural comparisons that can be drawn between this band and genre pioneers such as Pink Floyd. Although the quartet has been around since the late 1980s, it’s nice to see Porcupine Tree getting some well-deserved accolades. Count me among the group’s newest fans. Next, I headed over to the Gobi tent to check out Girls. The San Francisco outfit played its loose Big Star/Brian Wilson/Lou Reed mix of neo-psychedelic power-pop to an enthusiastic crowd. Although I enjoy the band's disc "Album" more than the show itself, versions of the Everly Brothers' "All I Have to Do Is Dream" and the group's own songs provided plenty of thrills to keep me parked in the hot tent for all of the band's 45-minute set. Maybe the second biggest disappointment of the fest for me was the set from English trio Band of Skulls. I am a big fan of the outfit's 2009 disc "Baby Darling Doll Face Honey." The group struggled early to get its sound and/or equipment working well and they didn't seem to be geared toward connecting with the packed crowd in the Gobi tent. "Death By Diamonds and Pearls" definitely got the headbangers going, but the set fell flat for me. In fact, after four songs, I bolted in search of an early dinner. Americana quintet Old Crow Medicine Show made its first-ever appearance at Coachella over the weekend, performing on the main stage on Saturday at 3 p.m. Because I was waiting to see Girls, I missed the group. Well, not entirely. Wanting to make the most of the day, Old Crow Medicine Show decided rather than simply do interviews in the VIP area, they would actually play an unannounced acoustic performance for fans gathered to meet and greet the band. I caught the end of that short set. After watching the fiery Nashville, Tennessee-based troupe perform “Jimmy Sutton” (a traditional square dance-minded classic), lead singer-guitarist Willie Watson talked about coming to Indio to be a part of the legendary festival. With Old Crow Medicine Show’s two performances complete, Watson said he was hoping to catch a few of the other acts performing later on Saturday. “I am really looking forward to seeing Devo,” he said. I grabbed something to eat (a burger I think) and then decided to watch Coheed and Cambria. The first act I was really able to see on the Coachella Stage, the band displayed good chops, but the music itself is simply not that original. I felt as if I had heard all the hard rock chops before. Sorry guys. Although a reunited Faith No More proved to be much stronger than Coheed and Cambria, it were Saturday's headliners that delivered the goods. Muse simply rocked Coachella in the way you want it to happen. Opening with a powerful "Uprising" and "Supermassive Black Hole," the band never looked back. The group's bigger-than-big sound reminded me of the Queen shows I caught when I was a youngster, and there is a powerful blend of classical music and arena rock that really works. Count me as impressed. Day two ended and merged into day three as I watched Devo thrill the masses not afraid to keep the party going as long and late as possible. Sure, Devo has been performing its artsy mix of new wave, punk, alternative rock and art damage since the early ’70s. But how wonderful to see the band pack the Mojave tent late Saturday night and generate the kind of excitement that usually greets newer acts playing the fest. What’s more, Devo’s new material — notably the infectious rocker “Fresh” — was just as powerful as the group’s big 1980 hit “Whip It.” The outfit still sounds timeless and modern, and the creative use of video juxtaposed with each song provided something magical that will surely (and quickly) become part of Coachella lore. By day three, I was pretty tired. The long days of standing in the blazing sun and getting up early to email posts to my editor had started to take their toll. But the good news, I saw some incredible performances on Sunday. Singer-songwriter Kevin Devine kicked things off just after noon with a politically-charged set in the Gobi tent and things only got better from there. L.A.'s Local Natives, Mutemath, Deerhunter and Sunny Day Real Estate all performed fantastic sets. But it were the trio of sets from Jónsi, Phoenix and Thom Yorke (with his outfit Atoms for Peace) that I will long remember. Jónsi – This Icelandic singer-songwriter’s solo album go is already one of my favorites this year, and the chance to see him showcase cuts off the newly-released nine-song disc drew me to the Outdoor Theatre early on Sunday. My expectations were high, yet the Sigur Rós frontman’s potent set exceeded them handily. When Jónsi closed with an extended and emotive “Grow Till Tall,” it was as if the desert sky had been shattered by his tenor voice soaring high into falsetto amidst the layered backdrop of percussion, keyboards and other instruments. One of the most original artists of the modern rock era, his blend of world music, rock, classical and experimentation continues to challenge, thrill and touch listeners on levels that defy most writers (this one included) to adequately convey it in words. If you haven’t seen Sigur Rós or Jónsi, please do — it’s a must. In terms of the sets from Phoenix and Thom Yorke's supergroup Atoms for Peace, these were also fantastic. Phoenix was upbeat and fueled a dance-styled craze on the field, while Yorke's show was intense and artful. I did check out some of Gorillaz' night ending display on the Coachella Stage, but truthfully I was so exhausted from the weekend that I headed for my car early. Coachella continues to be one of the strongest concert events on my calendar and I hope to be able to make it an annual event. Pity those who didn’t get to Coachella early on day two. Two of the best performances I caught on Saturday amounted to a one-two punch on the Outdoor Theatre stage, thanks to Long Beach-based Rx Bandits’ 55-minute set and Porcupine Tree’s foray on the same stage that was to follow. The band now plays a masterful blend of folk, blues, jam rock and doses of just about everything. Master chops and strong song selection were key to RX Bandits’ solid outing at Coachella, including several tracks where singer-guitarist Matt Embree and lead guitarist Steve Choi would dual on electric guitars. Bassist Joseph Troy and drummer Christopher Tsagakis were part of the well-armed outfit. Although the quartet has been around since the late 1980s, it’s nice to see Porcupine Tree getting some well-deserved accolades. Count me among the group's newest fans. I got to bed around 3 a.m. this morning and I'm realizing I won't be able to post any in-depth accounts of my music experience at Coachella until I return to The OC next week. I just don't have the energy and I want to process what I've seen. However, I will tell you I saw many fantastic performances and Coachella lives up to its legacy yet again. As Tall As Lions, Passion Pit and Hockey were among the newer artists I had not seen before that delivered fine performances, and it was fantastic to finally see Echo & the Bunnymen for the first time. I'll have more to share for sure in the days ahead, including news, reviews and photos! 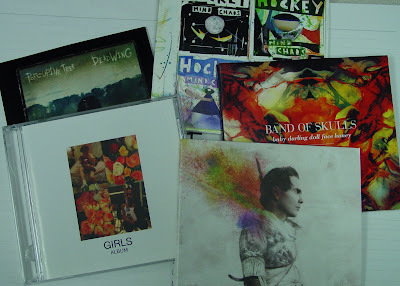 A bunch of new discs ranging from the latest disc from Thom Yorke ("The Eraser") to Jonsi's "Go." But the list goes on and on: As Tall As Lion's "You Can't Take It With You" and Band of Skulls' "Baby Darling Doll Face Honey." You get the idea. Lots of music from bands set to perform at Coachella this weekend. I always look forward to heading east out past the wind farms and Palm Springs, and to Indio, where cutting-edge artists perform in the most amazing of settings amidst a sea of music fans ready to brave the scorching sun during the day and unpredictable weather at night. I hope to update this blog on a daily basis with mini-reviews of the music, artwork and overall experience that is Coachella. My hope is the three-day concert is worth the lack of sleep, aching feet, stench of humanity and lackluster food that come with a huge music fest. Some of the artists I plan to see (if things line up since there are five stages and many of the performances overlap) include Muse, Phoenix, Porcupine Tree, Jonsi, Girls, Band of Skulls, Grizzly Bear, Hockey (whose 2009 album "Mind Chaos" is very good), She & Him (I love the duo's latest disc), aforementioned As Tall As Lions, Thom Yorke, DEVO and many, many more! I'll check in with you on Friday or Saturday this week. To be continued. CERRITOS, CA - Two Tickets to Paradise is the theme for the 17th Annual Friends of Arts Education Gala on Saturday, April 10. The event, to be held at the Cerritos Center for the Performing Arts, will benefit arts education outreach programs. Each year this event benefits arts education outreach programs and offers guests two ways to support the cause - guests can purchase a concert-only ticket for Eddie Money's performance - or enjoy the full-evening festivities which includes cabaret seating for the performance, an elegant dinner by Choura Event Catering and silent and live auctions. Full-evening Gala tickets are $185 and are available from the Friends of Arts Education at (562) 916-1272. Concert-only tickets are $52 and $37. Tickets are available at the Cerritos Center for the Performing Arts Ticket Office, by calling (562) 467-8818, or at www.cerritoscenter.com. All proceeds support Friends arts education programs. For more information on this event and how to get tickets, please visit www.cerritoscenter.com or www.friendsofaecc.com. The Church may be celebrating its 30th anniversary in 2010, but after catching the Australian quartet deliver a dynamic and wide-ranging performance before a packed house at the Coach House on Friday night, April 2, fans can certainly be thankful this is no farewell tour. The band kicked off its self-dubbed “The Church: An Intimate Space” 30th Anniversary American Tour” at the Coach House with a fantastic show that included a few technical glitches in the early minutes, but quickly evolved into a dramatic and wide-reaching celebration of the outfit’s distinctive sound and approach. As promised in the promotion of the tour and the free colorful program passed out to everyone as they stepped inside the venue (what a contrast to the $30 necessary to purchase a program at the Paul McCartney concert earlier in the week), bassist-lead singer Steve Kilbey, guitarists Marty Willson-Piper and Peter Koppes and drummer Tim Powles started the show with a song (“Pangaea”) from their latest album (Untitled #23) and proceeded to offer other songs from earlier albums in reverse chronological order as the night went on. Although the group didn’t follow that formula perfectly, it was hard to argue with a set list that allowed the band to play songs that showcased its dreamy neo-psychedelic alt-rock in all its various shades. 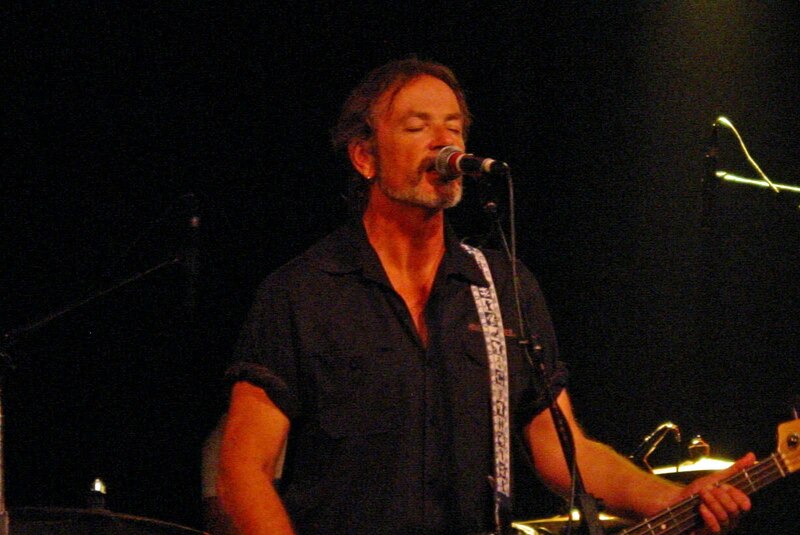 There was edgy rock (“Space Needle”) with Kilbey (seen above in a picture I snapped on Friday night) kicking off the song singing to the accompaniment of his bass guitar, which he strummed like a guitar before the rest of the group kicked in. And the Church offered up a reworked version of its hit “Reptile” like a jazz song – except for the classical-styled solo that Willson-Piper added with his acoustic guitar. While many casual fans likely counted the band’s “Under the Milky Way” as a favorite performance of the night, there were other selections that easily equaled that hit thanks to the enthusiasm of the band and lush arrangements offered up by the Church. Indeed, all four members of the troupe played a variety of instruments throughout the two-hour concert. The beautiful “Ionian Blues” and “Invisible,” the Americana-tinged “Louisiana” with Koppes adding some textured mandolin and the up-tempo rocker “Comedown” came in the first set, while the second half of the show surprised at every track thanks to the momentum of the performance. This was truly a night to celebrate a great band whose music and songs still resonate. It’s no wonder that relatively few in the near-capacity crowd left before the concert came to a close at midnight.